The epic conclusion to the internationally bestselling Nevernight Chronicle series from New York Times bestselling author Jay Kristoff. The greatest games in Godsgrave’s history have ended with the most audacious murders in the history of the Itreyan Republic. Mia Corvere, gladiatii, escaped slave and infamous assassin, is on the run. Pursued by Blades of the Red Church and soldiers of the Luminatii legion, she may never escape the City of Bridges and Bones alive. Her mentor Mercurio is now in the clutches of her enemies. Her own family wishes her dead. And her nemesis, Consul Julius Scaeva, stands but a breath from total dominance over the Republic. But beneath the city, a dark secret awaits. Together with her lover Ashlinn, brother Jonnen and a mysterious benefactor returned from beyond the veil of death, she must undertake a perilous journey across the Republic, seeking the final answer to the riddle of her life. Truedark approaches. Night is falling on the Republic for perhaps the final time. Can Mia survive in a world where even daylight must die? New York Times and internationally bestselling author Jay Kristoff’s writing has been praised by critics and readers alike and has won many awards, including four Aurealis Awards, an ABIA, and David Gemmell Morningstar and Legend awards. 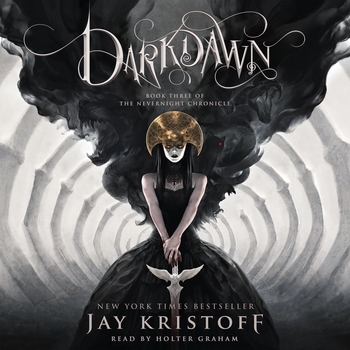 JAY KRISTOFF is the New York Times and internationally bestselling author of The Lotus War, The Illuminae Files and The Nevernight Chronicle. He is the winner of four Aurealis Awards, an ABIA, nominee for the Locus award, David Gemmell Morningstar and Legend awards, named multiple times in the Kirkus and Amazon Best Teen Books list and published in over thirty countries, most of which he has never visited. He is as surprised about all of this as you are. He is 6’7 and has approximately 12,365 days to live. He abides in Melbourne with his secret agent kung-fu assassin wife, and the world’s laziest Jack Russell. He does not believe in happy endings.